Benzoic Acid, CAS# 65-85-0, is an organic compound manufactured through chemical synthesis, available as White crystallized powder. Benzoic Acid and its salts (such as Potassium Benzoate and Sodium Benzoate) are widely used as preservatives for acidic food and beverage. It is widely accepted as safe food additive in many countries with E number E210. As a professional supplier and manufacturer of food additives, Wuhan biet has been supplying quality Benzoic Acid to customers all over the world. If you have any questions or wish to receive a quote, please feel free to reach us by email, or by phone: +86 27 8369 8488. Our sales person will get back to you in 1 working day. · Food Grade: Benzoic Acid is widely used as preservatives in food and beverage industries. Foodchem's food grade Benzoic Acid is available as white crystallized powder(>99.5% content). · Industrial Grade: Benzoic Acid is widely used as used in the industry . 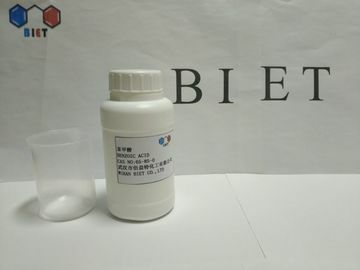 Wuhan biet’sindustrial grade Benzoic Acid is available as . At Wuhan biet, we apply strict quality control process to all our products. All Benzoic Acid we provide has been strictly tested under HACCP and ISO standards and proved to be safe for using as food additive. Handling Precaution: Handling of Benzoic Acid should only be performed by personnel trained and familiar with handling of organic chemicals. Avoid skin and eye contact and breathing in dust. Avoid handling which leads to dust formation. Benzoic Acid is a organic compound widely used as preservatives in food and beverage industries. As a preservatives, Benzoic Acid can be used in a wide variety of industries including: food production, beverage, pharmaceutical, cosmetics, agriculture/animal feed, and various other industries.